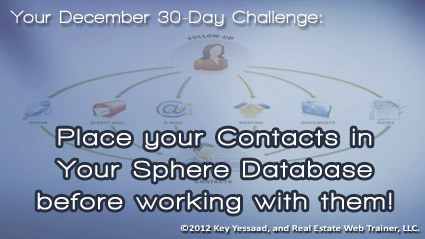 Your December 30-Day Challenge is about becoming an effective Real Estate Agent with your Sphere of Influence. One of the worst habits you can develop is to enter into a customer relationship using scraps of paper and never entering the person in your Sphere Database. Let me explain; as you grow your business you are going to need multiple databases but they do not all serve the same purpose; this post is not about all of the databases you should have but about your core Sphere Database, the one that syncs with your Smartphone, Tablet, and Computer. Let us say you have a Gmail Account, well it comes with a Contact Manager and the ability to take notes about your contacts and your conversations with them. Your Challenge for the month of December is simple – as soon as you enter into a talking or emailing relationship with a potential client or colleague, go to your contact manager; enter their contact information; add their picture (they are all online on Facebook); Categorize them – Placing colleagues and potential clients to categories is crucial; finally write a time-stamped note about how you came to know them and what major ideas you should remember about them. When you do this right you will have at your fingertips all the necessary data to nurture those with whom you are Talking, Texting, and Emailing and generate more business. Try it for 30 Days, you will be amazed how you were able to function without this simple idea. * I found that there are various 'bad' links pointing to your website. You can confirm this by searching your website on the key search engines search boxes - Google, Yahoo & Bing. Simply search by entering your website: URL. * Duplicity in the contents has been found which can be negatively affecting your website search rankings. You can simply verify this at copyscape.com. We can help you fix these problems and get your website ranking on the top page of Google, Yahoo & Bing! We can help you develop the visibility of your website in all major Search Engines to increase website traffic, sales and popularity in the target area. If you are interested in receiving affordable Search Engine Optimization (SEO/SMO/SEM) done for your website, just email us back and get a full affordable SEO proposal. My name is John Smith and I am a Digital Marketing Specialists for a Creative Agency.